Chaikin Money Flow (CMF) is indicator in technical analysis created by Marc Chaikin. CMF indicator relies on premise that buying pressure exists when stock closes in upper half of period's range and there is buying pressure when stock closes in lower half of period's range. Indicator provides trend confirmation and warns about breakouts. CMF calculation is based on Accumulation/Distribution indicator (A/D). For period (n) is usually taken value of 21. Generally, CMF indicator could be used as an indicator of buying and selling pressure. When CMF is above zero it is indicator of buying pressure and when it is below zero it is indicator of selling pressure. Duration of positive or negative readings is also important. The longer CMF is above zero, there is more evidence that financial instrument is under sustained accumulation. 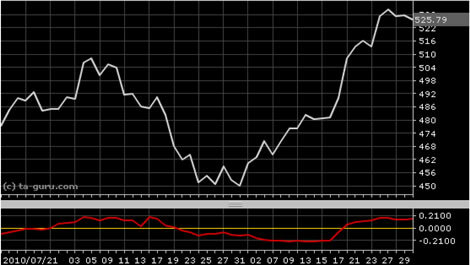 Another important parameter is indicator's value: values above 10 are indication of bullish signal. Values greater than 25 are indication of strong buying pressure. Open chart for google with Chaikin money flow indicator.